"Four Brothers. Four Criminals. For The Money... They Would Stop At Nothing." This film is based on actual events that took place in 1920's Texas. It centers around four real life brothers, the Newtons. They in unison go out and rob banks along with an accomplice who acts as a safe cracker. The Newton Brothers became well known throughout the region and country because of the down home tactics they employed to rob banks. They used a lot of gun power, but no one was ever killed during their course of their robberies. The film moves quickly as the brothers are constantly planning their next heist and ways in which to liquidate their caches of stolen money. 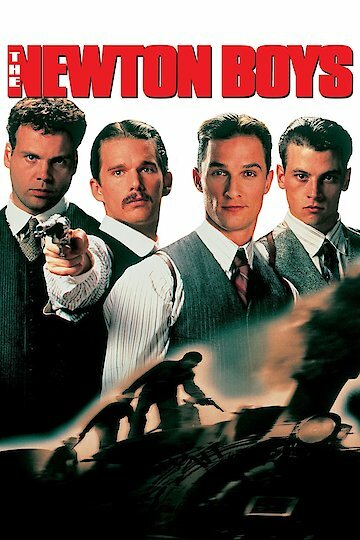 The Newton Boys is currently available to watch and stream, download, buy on demand at Amazon Prime, Amazon, Vudu, Google Play, FandangoNow, iTunes, YouTube VOD online.